General Alfred Terry (1827-1890) – Terry was a Union general in the American Civil War and the military commander of the Dakota Territory from 1866 to 1869 and again from 1872 to 1886. Born in 1827 in Hartford, Connecticut to a prosperous family, they soon moved to New Haven, where Terry grew up. Having a good education, he became a lawyer and was appointed as the clerk of the Superior Court of New Haven County in the 1850’s. At the outbreak of the Civil War, Terry raised a regiment of Connecticut volunteers and led them into battle at First Bull Run, as well as other engagements in Virginia, the Carolinas and Georgia. His success on the battlefield earned him a promotion to brigadier general during the war. In 1866, Terry became military commander of the Department of Dakota and would play an important role in the army’s long and often ruthless campaign against the Indians to gain control of the northern plains. In 1867, he served as a member of the peace commission that finally ended Red Cloud’s attacks by negotiating the Fort Laramie Treaty of 1868. Terry’s legal training and judicial experience would lead to his selection for many similar commissions throughout his career. Terry then left the Dakotas for a post in Georgia, where he was a commander in the reconstruction activities and strong opponent of the emerging Ku Klux Klan. By 1872, however, he returned to command of the forces in Dakota Territory, providing military protection for the Hayden survey of the Yellowstone region and a survey of the Canadian border. Terry became George Armstrong Custer’s commanding officer in 1873, when the Seventh Cavalry was posted to the Dakotas, and the following year, he found himself caught up in controversy when Custer’s well-publicized expedition into the Black Hills triggered a gold rush onto land that had been set aside for the Lakota under the Fort Laramie Treaty, which Terry, himself, had helped negotiate. 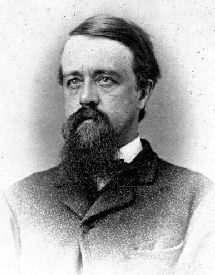 Terry then became a member of the Allison Committee, which attempted to purchase the Black Hills from the Lakota in 1875, and following the committee’s failure, he directed the 1876 campaign to force the Lakota and their allies onto reservations. After the massacre at the Little Bighorn, Terry accepted unmerited criticism rather than tarnish Custer’s reputation. He ordered the court-marshal of Major Marcus Reno, Custer’s second-in-command. Terry never fought again. In 1886, he was promoted to major general and was given command of the Division of the Missouri, headquartered in Chicago.Terry became seriously ill in 1888, retired from the army, and died two years later in 1888 in New Haven, Connecticut, where he is buried in Grove Street Cemetery. Carolina in January 1865, by L. Prang & Co., 1887. 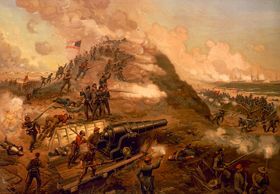 The joint amphibious assault under Rear Admiral David D. Porter and Major General Alfred H. Terry took Fort Fisher, the key in the defense of Wilmington, North Carolina, which was the last port by which supplies from Europe could reach General Lee’s troops at Richmond, Virginia.